So, I happened to be flipping through an old manual for Final Fantasy II for the SNES (actually FFIV, it was released in the U.S. titled FFII, yadda yadda you're all geeks you know the story), and I happened to come across this interestingly lazy translation which I've scanned just for you. 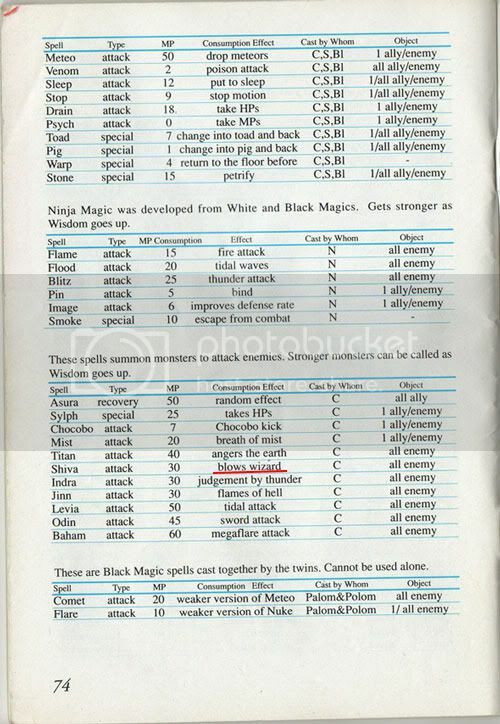 It's on the page where the various magic spells and their effects are listed. Direct your attention to the Shiva summon. I wonder who the lucky wizard is? Well, at least it's Shiva and not, say, Ifrit. That would be painful. ^ Oh, I played the Japanese version, and I assure you the blowing is much more authentic. Have I ever told you that I'm a powerful wizard?